I am a 29 year old Desktop Publisher living in Indianapolis, IN. I'm a professional weight loser. AGE 17/18 - I lost 70 pounds in high school going from 220 to 150 my senior year just from exercising. AGE 23 - My senior year of college I gained back 25 of those 40 that I lost on weight watchers and after I graduated college in 2003, I went back to weight watchers and went from 205 pounds down to 160!!! Pretty much after I went down to 160, I maintained that for about a year but I had just moved down to Indianapolis from Chicago and hadn't really found my "niche" yet - going from job to job - relationship to relationship - my weight suffered (even though I was constantly exercising and "dieting") and I gained back 20 pounds...then I found my FANTASTIC job in June of 2005 and then in October 2006 I started dating the most FANTASTIC man. 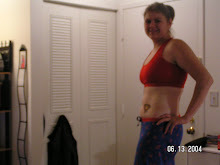 But - after we started dating - I tried to get back into exercising and eating right and even though - in 2007 I was honest to god exercising 4 times a week AND eating right - I couldn't lose ONE FREAKING OUNCE!!!! I went to the doc in October of 2007 and she diagnosed me with Insulin Resistance. Meaning that when I eat carbs, they just turn straight to fat. :( my body just doesn't process sugar and carbs like a normal person - and so I couldn't lose weight. She put me on metformin and told me to try the Atkins diet - but I'd always been SO incredibly against "low carb" diets because I'd ALWAYS heard that they were "bad" for you...but I did lose about 20 pounds last year doing the weight watchers CORE program (basically all non-processed foods). Then my boyfriend proposed in June and we started looking for a house in September so the weight came right back on because I stopped going to the gym and I stopped exercising.